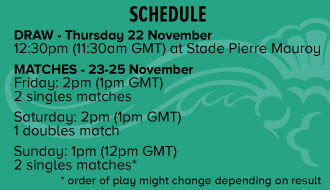 France will return to familiar surroundings after the Federation France de Tennis (FFT) announced the 2018 Davis Cup by BNP Paribas Final against Croatia will be contested at the Stade Pierre Mauroy on 23-25 November. It will be the third time in five years that Lille has played host to the Davis Cup Final with France falling to Switzerland there in 2014 before defeating Belgium to claim the historic trophy in 2017. The FFT is expected to announce the surface for the contest next week. Whether it’s a clay court or a hard court one thing is for sure - a capacity crowd can be expected for Yannick Noah’s last tie in charge of Les Bleus. In 2014, a record-breaking 27,448 fans watched Roger Federer lift the Davis Cup title – the biggest crowd ever to watch a tennis match. And last year more than 24,000 fans saw France lift the Davis Cup trophy for the first time in almost two decades. This will be the third meeting between France and Croatia, with the home team prevailing in both of their previous encounters. France won a 2004 World Group first round clash in Metz 4-1, but Croatia scored a 3-2 victory in the semifinals two years ago, when Marin Cilic won two singles rubbers and partnered Ivan Dodig to a doubles triumph. Ticket information will be announced by the FFT on Tuesday 25 September. It's up to the teams - if they want to play the final match they will. I thought Canada wanted to get Auger Aliassime out for some Davis Cup experience but Shapovalov was warming up for the 5th match - til Raonic was up 2 set to none - then they cancelled the 5th match. Shapovalov was flying to St. Petersburg Sunday night so I understand that decision. 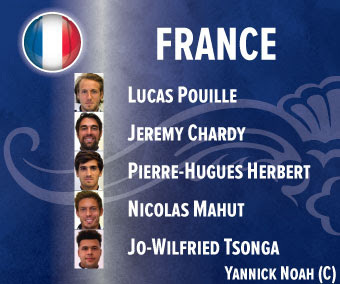 Lucas Pouille’s omission from Yannick Noah’s singles nominations was the big news in Lille when the French and Croatian line-ups were revealed ahead of this weekend’s Davis Cup by BNP Paribas final which kicks off inside the gigantic Stade Pierre Mauroy on Friday afternoon. With the French already missing their three highest-ranked players for one reason or another - Richard Gasquet, Gael Monfils and Gilles Simon - it came as a surprise when Noah confirmed the recently-injured Jo-Wilfried Tsonga and Jeremy Chardy as the two men who would spearhead the host nation’s title defence against two opponents both ranked inside the world’s Top 12. 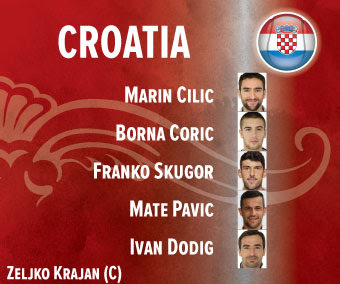 In contrast, Croatian captain Zeljko Krajan's nominations were as expected at Thursday’s draw with world No. 7 Marin Cilic and Borna Coric, ranked five places lower, both fit, healthy and brimming with confidence after outstanding seasons on tour. Chardy will kick off the tie against Coric at 2pm on Friday, before Tsonga faces Cilic in the opening day’s second rubber. In Saturday’s doubles Nicolas Mahut and Pierre-Hugues Herbert will be marginal favourites when they take on the Croatian pair of Mate Pavic and Ivan Dodig before the reverse singles on Sunday that may or may not feature Pouille. On paper, Noah’s decision looks brave given Tsonga has played just five matches since returning to the tour after seven months out following knee surgery in early April. He will be hoping the former world No. 5’s fitness holds up on the indoor clay and that Chardy can turn around a poor recent run of form that has seen him win just five matches since this summer’s grass season. “For the last two months I was looking at so many ways, so many options, so many players,” said Noah, who hopes to finish his third term of captaincy with a fourth Davis Cup title. “I had to decide whether I was putting first their spirit, their involvement with the team, their recent results, their health, so there were a lot of things coming into play. While some were raising eyebrows in northern France, however, the visiting captain Krajan said that Chardy’s inclusion came as no great surprise - and was entirely in keeping with Noah’s personality and leadership skills. “When we heard that Monfils and Simon weren’t playing and then with Gasquet pulling out, [when you] follow Yannick’s moves sometimes he has some ‘jokers’ that he pulls out of his pocket,” he said. The three factors that Noah is hoping help make a nonsense of the ranking differences are the home team’s choice of surface, French support inside a 26,429-capacity venue and the time his team has had to prepare, especially given Cilic, Coric and Pavic were all in London at the ATP Finals playing on indoor hard courts up until last weekend. “Since my guys didn’t have too many good results lately, first we decided to play on clay,” Noah said. “We’ve been on clay for about three weeks now including last week in a very intense way. “Playing here is special. It’s the best indoor tennis venue that we can have in France. It’s a weekend that for many reasons is going to be historic. French hopes of an unlikely 11th Davis Cup by BNP Paribas title are still alive after Nicolas Mahut and Pierre-Hugues Herbert combined to win a thrilling doubles in Lille on Saturday, a result that takes their 2018 final with Croatia into a third day. Trailing 2-0 at the start of play on Saturday, the French pair had to win to keep the tie alive and they gave a deafening Stade Pierre Mauroy crowd of 22,910 exactly what they came for with an emotional 64 64 36 76(3) victory over Mate Pavic and Ivan Dodig. The result still leaves Yannick Noah’s men with an awful lot to do on Sunday - they have to win both the reverse singles to deny Croatia its second Davis Cup title - but with the backing of another huge crowd the hosts will feel anything is possible. From the moment a spine-tingling rendition of the French national anthem ‘La Marseillaise’ rang around a packed stadium, it felt like such a unique atmosphere might play a part. Mahut and Herbert made the quicker start and rode that wave of support throughout three hours and 38 minutes of absorbing tennis. After the first six games were shared and with Dodig serving in game seven, the French combined superbly to make their first move. First Herbert ripped a return past the Croats to bring the scores back to deuce before Mahut matched his partner’s quality, bringing up break point with a forehand return on the stretch that flew past a motionless Pavic. With the Croats facing break point and with all four men at the net a short backhand from Dodig flipped up off the net band, hopped over and left Herbert with a simple put-away. He duly crunched his backhand into Pavic’s toes, the locals erupted and that break of serve proved the difference after 42 minutes. The second set was a similar story, and again it was Dodig’s serve that came under pressure, this time in the ninth game. The 33-year-old double-faulted to trail 15-30 and after a lucky Herbert return flipped off the net band and over Pavic’s racket the visitors found themselves down 15-40. A second double fault of the game followed, the French had their second break of the match and Mahut served out the set. When the French struck again in the first game of the third it felt like a straight-sets win would be a formality before Dodig and Pavic dug themselves out of the deepest of holes. Serving at 0-2, Dodig saved four break points to avoid falling a double break down. They then produced their best tennis of the match during the sixth game to break Herbert for 3-3. Dodig held again for 4-3, broke Mahut for 5-3 and Pavic wrapped up a remarkable set with their fifth successive game. The fourth was nip and tuck until a tenth game full of noise and drama. With Pavic serving to keep his team in the match at 4-5, a perfect Mahut return to the server’s feet helped earn the French the first point, a crunching Herbert forehand earned them the second before Pavic folded under the noise by throwing in a double fault to trail 0-40. Despite the left-hander having to wait for around a minute for both sets of supporters to settle, he calmly produced four big serves and a drop volley to level the set at five games all. A tiebreak finally settled it, the French pouncing early when Herbert smoked a forehand return up the middle for the first mini break. They quickly built on that advantage and converted their four match point to ensure dreams of an 11th trophy are still alive in Noah’s final tie in charge. Pouille in for Chardy in first match today. Playing Cilic. Beautiful final #DavisCup scenes. We'll never see that again, so it was good to enjoy that moment. It started as a competition between the USA and the UK. It seems fitting that the last real winner of the last real Cup is a small country that has clawed up the tennis ladder, and whose players felt it was duty, not money, that compelled them to play. 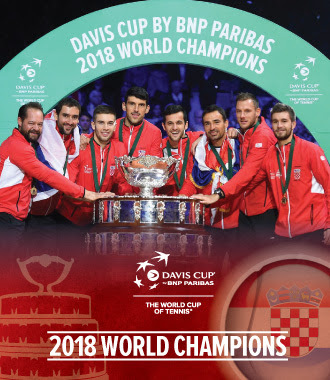 Croatia are Davis Cup by BNP Paribas champions for a second time after Marin Cilic blocked out a deafening French crowd to beat Lucas Pouille in straight sets and deliver a historic 3-1 victory for the visitors in Lille. Cilic produced the better tennis during key moments and held his nerve impressively throughout a 76(3) 63 63 success over the world No. 32, who was a late replacement for Jeremy Chardy in the first of Sunday’s singles. Even after winning Saturday’s doubles to haul the overall score back to 2-1, Yannick Noah’s men still had to win both Sunday’s singles to become the first team since 1939 to overturn a 2-0 deficit in a Davis Cup final. But the Croatian No. 1 was simply too solid in all departments, leading his team superbly all weekend by winning all six sets he played. He wasn’t broken once during two matches on the indoor clay and didn’t face a single break point against Pouille. The victory sees Croatian captain Zeljko Krajan emulate countryman Nikki Pilic, who led the nation to its first victory in the competition against Slovakia in 2005. Croatian President Kolinda Grabar-Kitarović was courtside in France to lead the visiting support. “It’s not every day that you become a world champion,” Cilic said. “For us it’s a dream come true. We are so passionate, you can see the fans are enjoying themselves. I feel that in Croatia it’s going to be incredible too. “I thought Lucas started well in the first set and just a single point made the difference. After that I played better and served better. I’m extremely proud of my performance. Noah had talked about the importance of home advantage on Sunday, and another enormous crowd of 24,144 inside the Stade Pierre Mauroy were leaving nothing to chance during the opening stages. Every strike of Cilic’s was jeered during the warm-up, every wayward first serve applauded. It was vital Pouille kept it close and hope that the wall of sound played its part. The Croatian has a recent history of struggling to close out matches, a trend that surely would have been discussed in the French locker-room. Pouille hung onto Cilic’s coat tails for as long as he could and did well to survive two break points during the opening set, the first in the third game and the second with a perfectly-executed dropshot at 4-4. Into a tiebreak they went and it was Cilic who played the better tennis when it mattered though. Pouille floated a backhand long to trail 3-5, Cilic hit a clean winner off the Frenchman’s next serve to go up 6-3 and he converted his first set point with a short angled backhand. The bad news for the French continued as the second set started to slip away as early as the fifth game. A bad bounce off a Cilic return at deuce resulted in Pouille missing a forehand and the Croat’s sustained depth and power on break point drew another error. In a flash, the former US Open champion was up 5-2. Pouille dug deep serving at 2-5 0-40, saving four set points in total, but another big game on serve from Cilic put him up two sets to love after an hour and 41 minutes. When Cilic broke for 3-2 in the third a small but loud pocket of travelling fans were sensing it was job done. They were right. Unfazed by the occasion, Cilic kept his focus until the very last ball, breaking again and sealing history for his nation on his third match point with a perfectly-weighted lob. In his last tie in charge of what has been his third term as the French captain, Noah was in full agreement.